The World Day to Combat Desertification, June 17 each year, was proclaimed by the United Nations (UN) General Assembly in resolution A/RES/49/1995. The day has been observed since 1995. However United Nations efforts on Desertification began in 1977 with the UN Conference on Desertification held in Nairobi. The desertification conference was convened by the UN General Assembly in the midst of a series of catastrophic droughts in the Sudano-Sahelian region of Africa. The conference was designed to be the centerpiece of a massive worldwide attack to arrest the spread of deserts or desert-like conditions not only in Africa south of the Sahara but wherever such conditions encroached on the livelihood of those who lived in the desert or in their destructive path. The history of the conference is vividly recalled by James Walls in his book Land, Men and Sand (New York: Macmillan, 1980). At the conference, there was a call for the mobilization of human and financial resources to hold and then push back the advancing desert. “Attack” may have been the wrong word and “mobilization” too military a metaphor for the very inadequate measures taken later in the Sudano-Sahelian area. Today, in 2011, there are real possibilities of famine in West and East Africa on the edges of the desert. Niger and Mali and parts of Senegal and Chad in the Sahel belt are facing the consequences of serious drought as are parts of northern Kenya and Somalia. The most dramatic case is that of Darfur, Sudan which partakes of the Sahel drought but which also faces a war in which the conflicts between pastoralists and settled agriculturalists have become politicized. It is estimated that 300,000 have been killed since the start of the war late in 2003. Some two and a half million people have been uprooted. The agricultural infrastructure of homes, barns and wells has been deliberately destroyed. It will be difficult and costly to repair this destruction. The Darfur conflict highlights the need for a broader approach to the analysis and interpretation of active and potential armed conflicts in the Sahel region. This analysis needs to take into consideration the impact of environmental scarcity and climate variation in complex situations. 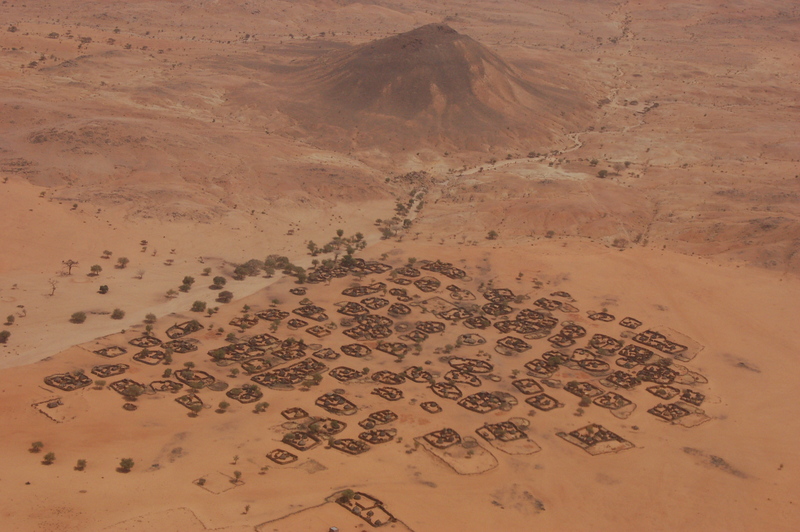 A settlement in the semi-desert north of El Fasher, Northern Darfur. Earth is our common home, and therefore all, as world citizens, must organize to protect it. It is up to all of us concerned with ecologically-sound development to draw awareness to both the dangers and the promises of deserts. What is the core of the desertification process? The destruction of land that was once productive does not stem from mysterious and remorseless forces of nature but from the actions of humans. 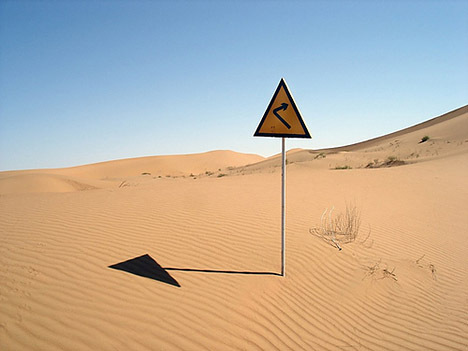 Desertification is a social phenomenon. The causes of dry land degradation include overgrazing, deforestation, agricultural mismanagement, fuel wood over-consumption, and industry and urbanization. Thus, by preventing land degradation and improving agricultural practices, action to combat desertification can lead to increased agricultural productivity and alleviate poverty. Humans are both the despoiler and the victim of the process. Increasingly, populations are eking out a livelihood on a dwindling resource, hemmed in by encroaching plantations and sedentary agriculturalists, by towns and roads. Pressure of population upon resources leads to tensions which can burst into violence as we see in Darfur and which spilled over into eastern Chad. Desertification needs to be seen in a holistic way. If we see desertification only as aridity, we may miss areas of impact such as the humid tropics. We need to consider the special problems of water-logging, salinity or alkalinity of irrigation systems that destroy land each year. The value of UN-designated Days is the creation of a process of identifying major clusters of problems, bringing the best minds to bear on them so as to have a scientific and social substratum on which common political will can be found and from which action will follow. Desertification is a plague that upsets the traditional balance between people, their habitat, and the socio-economic systems by which they live. Because desertification disturbs a region’s natural resource base, it promotes insecurity. Insecurity leads to strife. If allowed to degenerate, strife results in inter-clan feuding, civil war, cross-border raiding and military confrontation. Yet dry land communities have great resources that can be put to fighting poverty and desertification, provided they are properly empowered and supported. In China, desertification spreads 1,300 square miles per year. The contrast between widespread rural poverty and environmental degradation, on the one land, and the opportunities which can be created on a small scale through community empowerment, access to groundwater and sustainable land management, defines the ideals of the Day. The Day is not about fighting deserts, it is about reversing land degradation trends, improving living conditions and alleviating poverty in rural dry lands. Thus, the World Day to Combat Desertification can be a Day during which we can learn more of the lives of the people in and on the edge of the deserts. Even trees can grow in the desert ... A sign of hope indeed. Now let's act on it. 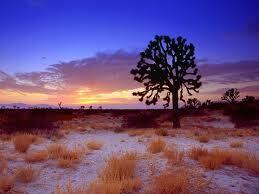 Deserts can also have a positive image. There is a significant role in the literature and mythology of spirituality — the 40 years in the desert before entering the “Promised Land” of Israel, the 40 days in the desert before starting his mission for Jesus, the life in the desert of the early Christian church fathers. Today, there are an increasing number of spiritual retreats in the desert chosen for its silence and for the essential nature of the landscape. Thus, during this Day our emphasis must not be on “combat” but on wise and ecologically-sound use of dry lands.